Create more filing and storage space affordably with the Bush Business Furniture Series A Collection 2 Drawer Mobile Pedestal finished in Hansen Cherry for versatile C-Leg table design permits easy configurations. The Mobile Pedestal features two file drawers on full-extension slides to keep your files at your fingertips. This Mobile 2 drawer Mobile Pedestal rolls conveniently under Series A Desk Surfaces to minimize your office footprint, or moves to where you need it most. This component offers locking file drawer and accommodates letter, legal or A4 files. This unit is constructed with 100% thermally fused laminate for durability and superior resistance to scratches and stains. Solid construction meets ANSI/BIFMA test standards. The Series A Collection is backed by the Bush Business Furniture 10 Year Warranty and is American made. Accessible: conveniently reach back of drawers riding on full-extension slides. Portable: smooth-moving casters make portability easy even when loaded. Compatible: works under all Bush Business Furniture Series A 36W, 48W, 60W and 72W desks. 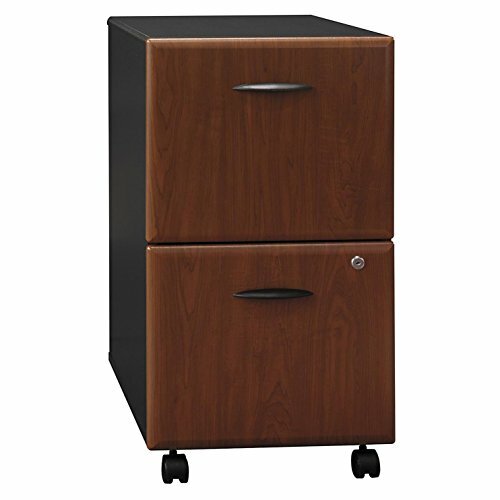 Spacious: 2 drawer mobile pedestal features two file drawers for extra storage.